Golf, like life, is not for the faint of heart. Sometimes you are going to be faced with a situation or a shot that scares the daylights out of you. You then have a choice to make. You can just pick the ball up and forget it. You can and probably should look for an easier way to avoid the difficult shot. But sometimes you just have to do it. When faced with most fear provoking situations, just remind yourself that failure is not the end of the world. If you crash and burn, it won't kill you. Chances are, even if you fail miserably, your dog will still love you and you'll still get your supper. So, why not go for it. Why not take a walk on the wild side and test yourself. You might just succeed. Kathryn isn't a golfer. But she won a trip to Florida and as part of this trip we were able to play the Copperhead course at the Innisbrook Resort near Tampa. The Copperhead course is a regular stop on the PGA tour and the course is known as one of the most difficult. 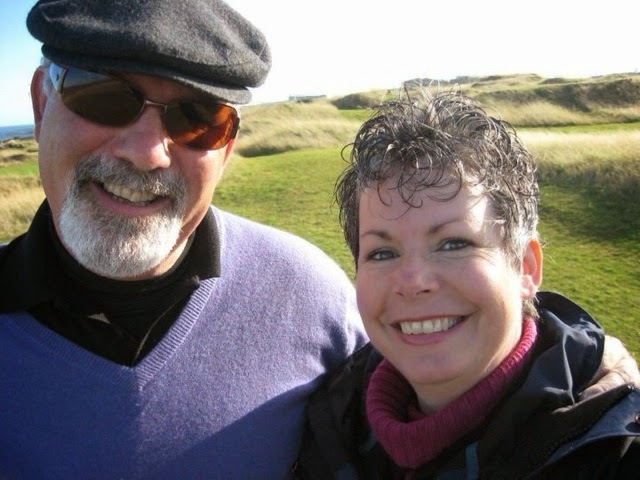 Kathryn had only played nine holes of golf before teeing it up at the Copperhead. For most of us real golfers, we would have found playing this course, especially accompanied by a stranger, rather daunting. But not Kathryn; she stood at the first tee and watched the group of men tee off. The last fellow took a mighty lash and dribbled the ball about sixty yards. Unfortunately, not understanding golfers and just how embarrassing this was for this fellow who had no doubt forked out about two hundred dollars for the opportunity to humiliate himself, Kathryn laughed and said, "I could play with you guys." This comment was met with an icy stare and I had to explain to Kathryn the facts of life regarding golf, namely that many golfers take themselves way too seriously and are not inclined to understand that when you laugh, you are just laughing with them and not at them. In fact, we could not laugh with this fellow because he definitely wasn't laughing. He had completely failed to see the humour in his rather pathetic tee shot. We patiently waited for the group ahead to zig zag their way out of range and began our adventure. Kathryn hits a low draw with a seven iron. It is a low draw that consistently goes between eighty and a hundred yards. From the forward tees it is enough to get her there or thereabouts in three shots on the par fours and four shots on the par fives. Fortified during the round by a steady supply of margaritas, Kathryn acquitted herself quite well. Her swing, though never going to be described as pretty, served her well enough to actually be scoring better than the young hockey player who was accompanying us. He hit it miles, but rarely in the intended direction, a recipe for disaster on the Copperhead course. We eventually came to a pretty little par three that required Kathryn to hit the ball over a pond. It just so happened that at this point we were being watched by a couple of men in a golf cart who looked to be important. I suspected we were being watched by the pro and the superintendent out for a drive, although they never introduced themselves. Kathryn looked at the water, looked at me, and in earshot of our observers asked me what on earth she supposed to do. There appeared to be no option but for her to hit the ball over the water. Both she and I knew she didn't have that shot, but there appeared to be no alternate route to the green. So I just told her to hit it, that in all probability the ball would skip over the water. She complied, took a swipe and hit that little low draw. The ball skipped two or three times over the water, ran up the bank and settled about ten feet from the pin. I smiled, Kathryn laughed and our two observers shook their heads. Kathryn learned the sheer joy of just doing it. If you just keep swinging a lot of good things can happen. Don't worry, just do it.